The US Army Corps of Engineers explained exactly how a Nuclear, Biological, and Chemical air filtration system needs to be built in their technical letter ETL 1110-3-498 Design of Collective Protection Shelters to Resist Chemical, Biological, and Radiological (CBR) Agents (PDF). 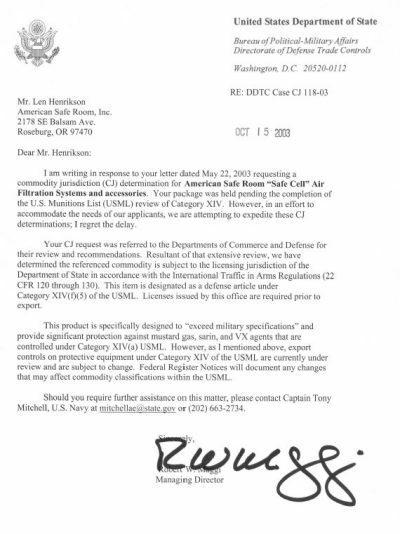 This is the document includes all of the design elements and specifications required to effectively filter radioactive fallout, chemical warfare agents, and airborne weaponized biological releases. The Safe Cell meets all of the critical requirements in this technical letter. The Safe Cell has been poorly copied twice – once in Israel and once in the USA. They have obvious design flaws, no documentation, and certifications. This page lays out exactly why you need to depend on the US Army Corps of Engineers and the Safe Cell for your NBC air filtration system. When properly installed, the Safe Cell will create a Class I protected area. This is filtration with pressurization that is applicable against wartime military threats that produce a large-scale release of agents over an extended period of time. 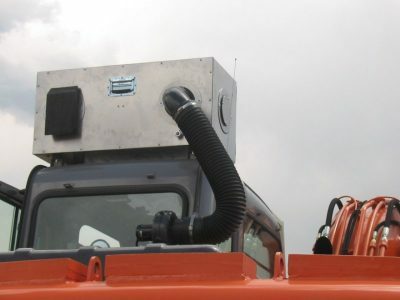 Effective protection requires a CBR filtration and overpressure system that resists a continual large-scale threat in a 40-km/hr (25-mph) wind. In the three filter sections below, there are links to PDF copies of testing and certification documents from our particulate filter and carbon suppliers. They show comprehensive documentation of the capabilities of the Safe Cell. And then we have a section of notable Safe Cell installations that show real world testing under extremely toxic conditions. Continuously operated filter systems will have a roughing filter with an average efficiency of 25 to 30 percent when tested in accordance with ASHRAE 52.1. The roughing filter extends the life of the intermediate filter or pre-filter and reduces its change frequency. The pre-filter or intermediate filter will have an average efficiency of 80 to 85 percent when tested in accordance with ASHRAE 52.1. 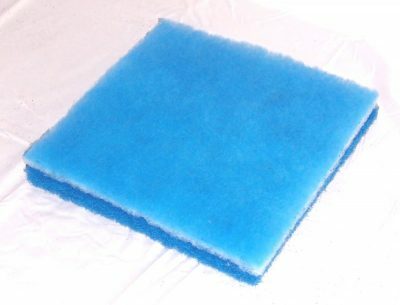 The pre-filter extends the life of the HEPA filter and reduces its change frequency. HEPA Filter. The HEPA filter frame and filter media will meet the construction, material, testing, qualification, and documentation requirements of ASME N509, ASME N510, and UL 586 and will have a filter efficiency of 99.97 percent at a 0.3 Fm diameter particle size when tested in accordance with the MIL-STD-282 dioctyl phthalate (DOP) test method. The filter frames will meet the requirements of ASME AG-1a, Section FC. 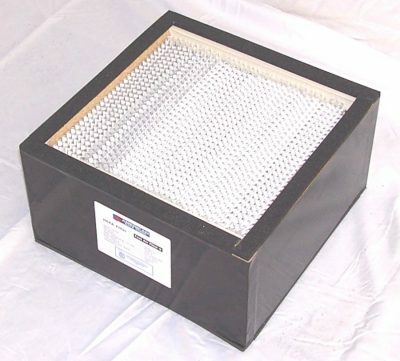 The HEPA filter medium will meet the requirements of MS MIL-F-51079D. The nuclear grade HEPA filters we use in the Safe Cell are individually tested and are placarded with a serial number and the tested efficiency. They all rate at least 99.97% efficient or they are discarded. See this Certificate of Conformance from the manufacturer. They are certified to contain nuclear grade media. MIL-STD-282 is a testing standard for HEPA filters that uses dioctyl phthalate (DOP). DOP has since been found to be a potential carcinogen and is no longer used to test HEPA filters. Emery 304 PAO is now used industry wide as a DOP replacement. MIL-F-51079 has been cancelled and replaced by ASME AG-1. We have certification (2 pages) from the Department of the Army, Edgewood Research Development and Engineering Center that that our filters use media that conforms to ASME AG-1. Unlike the particulate filters, gases cannot be “filtered.” The process of adhering the molecules of a gas onto the surface of the carbon is called adsorption. Because of this process, the airflow must remain in contact with the carbon for a period of time. 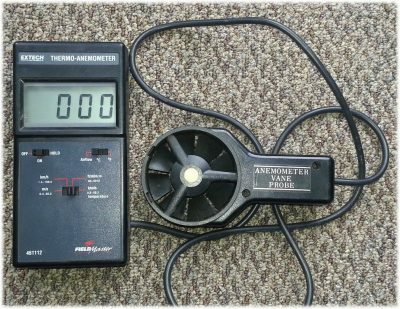 We use a calibrated digital Extech Thermo-Anemometer to measure the system output of our 60 and 120 CFM Safe Cells. 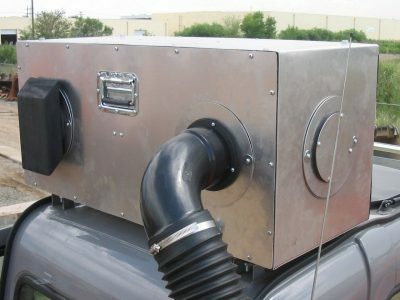 This is a true system output that has the airflow going through all of the filters as well as the intake hose. 120 CFM x 7.33 inches = 879.6 / 60 seconds = 14.66 inches per second. 14.66 inches / 4 = 3.67 inches in a quarter of a second. This is under the four inches of carbon bed depth in the Safe Cell. The air will have the required one quarter second of residency time in the carbon. 60 CFM x 15.67 inches = 940.2 / 60 = 15.67 inches per second. 15.67 inches / 4 = 3.91 inches in a quarter of a second. This is where the Safe Cell deviates from the specification. We decided to use a carbon blend that is optimized more for radioactive iodine and a little less for the higher volatility warfare gases like hydrogen cyanide. Radioactive iodine is a gas (not a particulate) that is generated by nuclear events like atomic bomb detonations and nuclear power accidents. We’ve sold thousands of Safe Cells and the overwhelming concern our customers have is for nuclear events. We worked with our carbon supplier to find a carbon that is optimized for radioactive iodine. The higher volatility warfare gases are volatile. Volatility is directly related to a substance’s vapor pressure. At a given temperature, a substance with higher vapor pressure vaporizes more readily than a substance with a lower vapor pressure. Once they vaporize, they are subject to rapid wind dispersal and dilution. For unknown threats and adsorption of volatile agents, ASZM-TEDA carbon conforming to EA-C1704 will be used. If the threat is known, the use of ASZM-TEDA may not be required. This will depend upon the chemical volatility of the threat. 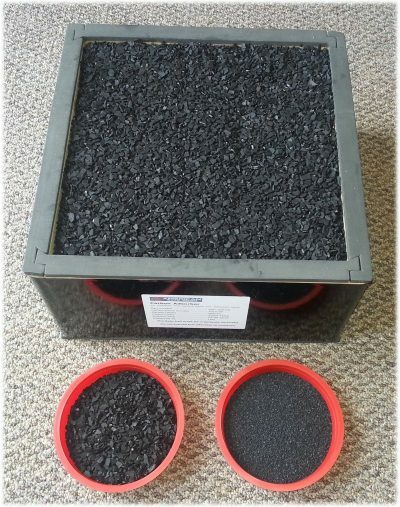 If agents of higher volatility, such as hydrogen cyanide and cyangen chloride are not a threat, activated carbon (not impregnated carbon) will suffice. The Safe Cell carbon is a blend of nuclear grade NUK-TK-TEDA and ASZM-TEDA. This carbon is optimized for radioactive iodine. It starts with a base carbon of virgin coconut shell carbon with over 60 CTC value. Then, it’s impregnated with potassium iodide (KI) along with the TEDA impregnates. When activated carbon is impregnated for any function, the base carbon continues to be effective for target gases that do not require impregnations to adsorb. The impregnation of carbon simply compounds the numbers and types of gases the carbon can now capture. The co-impregnates of KI and TEDA have other reactive benefits for various gases. The KI portion of the impregnation is excellent for sulpherous compound removal. This carbon is optimized for the higher volitility warfare gases. Virgin coconut shell carbon is impregnated with copper, silver, zinc, molylebeunm, and triethylenediamine. ASZM-TEDA is Calgon Carbon’s military-use impregnated carbon. It was designed to be a chrome-free replacement of ASC carbon used by the military beginning in WWII. It is also used in the Industrial environment for first responder masks designed to protect against cyanide, cyanogens chloride (CK), and a variety of other harmful gases. This versatile carbon is designed to protect against many of the chemical weapons the government lists as potential homeland threats. The Safe Cell has been through the Commodity Jurisdiction process by the US State Department’s Directorate of Defense Trade Controls. Due to its high level of air filtration, it was found to be a munitions and its export is controlled. Additionally, the ASZM-TEDA carbon is controlled as well. A license must be obtained from the U.S. Department of Commerce before an adsorption filter containing ASZM-TEDA carbon can be shipped outside the United States. In 2003, the Safe Cell was selected to protect heavy equipment operators removing radioactive debris from the Rocky Flats Nuclear Plant. These Safe Cells were mounted on cabs of excavators and dump trucks to overpressure the cab and isolate the operators from the plutonium, carbon tetrachloride, beryllium, and tritium that was in the soil they were removing. We were told by the contractor that this environment had the most dangerous airborne toxins of any Superfund site to date. They had zero incidents with the operation of the Safe Cells and no reported symptoms by the equipment operators. Because there was very little room in the small cabs, American Safe Room designed custom enclosures that mounted on the roofs. The configuration of these filters had to change as well. 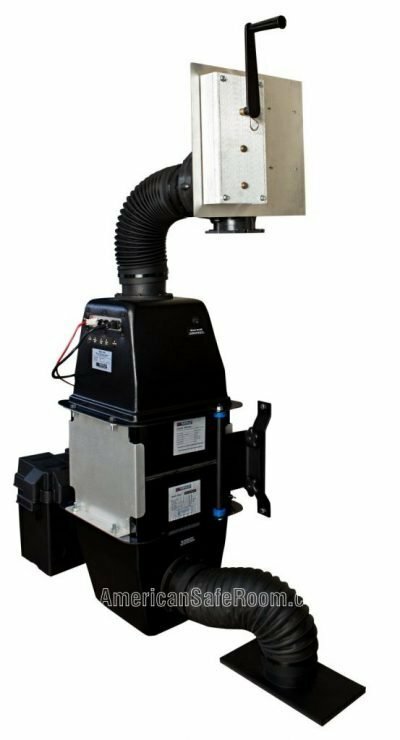 Normally, the Safe Cell mounted inside the protected space and the blower draws the air through the filters. As per ETL 1110-3-498 when the NBC filter is mounted outside the protected space, the blower needs to push the air through the filter bank. The Safe Cell was selected by a leading manufacturer of mobile testing labs to protect the operators and equipment of mobile substance analysis lab vehicles. These vehicles are used to test for chemical and biological agents. These filtration systems use the same certified filters that all of the Safe Cells are shipped with, but we added a separate port on the top end bell and the manufacture used it to bypass the filters to provide fresh (unfiltered) air to the protected space. Note the triangular valve housing to the left of the Safe Cell that switches the incoming air between the bottom and top end bell – before or after the bank of filters. 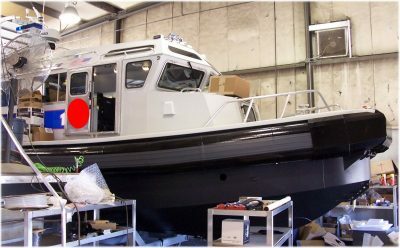 The Safe Cell has been selected by four different boat manufacturers to protect the crew and interdiction teams in harbor patrol boats used in major American ports. There are 11 boats in use now that have Safe Cells. These boats are used to inspect cargo ships and insert interdiction teams onto the ship when a threat is suspected. If a nuclear, chemical, or biological event were to happen, the Safe Cell will allow them to safely remain on station to support and remove the team. 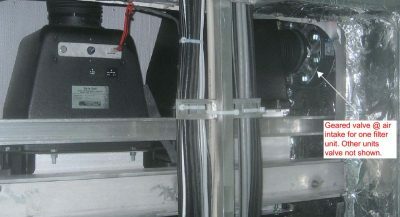 These two Safe Cells were installed in an armored patrol vessel that is currently in use in a major American seaport for the exfiltration of high value targets in the event of a terrorist attack. They were installed and tested by the boat manufacturer and have been received and commissioned by the port authority. 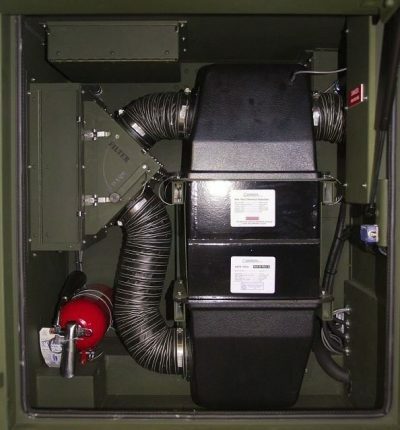 The Safe Cell was selected to be installed in a series of armored snow vehicles made by a defense contractor in Europe for a military customer in Asia. American Safe Room received an export license for these units from the US State Department Directorate of Defense Trade Controls. 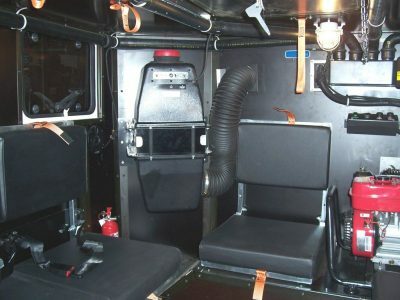 They were mounted inside the cab of the vehicle, switched remotely, and used to provide overpressure protection for the crew.